The Big Island of Hawaii is BIG, hence the name, but along with it’s smaller sister islands, it has tons of things to see and do and experience for not a lot of money. ‘Akaka Falls State Park – at $5 per car entrance fee, you can take a pleasant walk to vistas overlooking both the Kahuna falls and the ‘Akaka Falls. Kalopa State Recreation Area- this one is completely free and you can head here for a family hike in the cool highlands 2,000 feet above sea level. The easy nature trail winds through a grove of native ohia trees. Additional lures: picnic areas and an arboretum with rare palms, hibiscus and other island plants. Mokupapapa Discovery Center- in Hilo, the discovery center explores the unique science, culture and history of the northwestern Hawaiian islands and surrounding marine environment. It offers hands-on exhibits, maps, murals, a saltwater aquarium and life-size models of sea life designed to educate and entertain. Punaluu Black Sand Beach- located on the southeastern tip of the Big Island, this beach is probably the most famous blank sand beach in Hawaii. 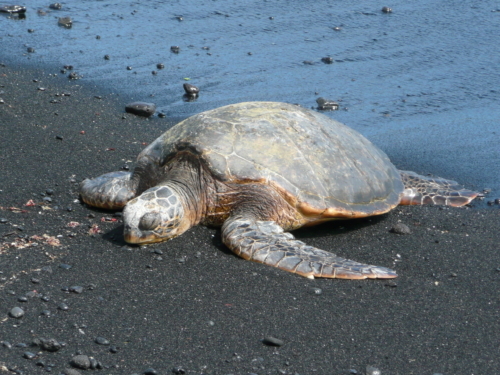 Also a home for the Hawaiian Green Sea Turtle, this is not really a swimmable beach but is definitely one to check out. PLEASE do not touch the turtles. My Vacation Lady is a Hawaii Destination Specialist and we strive to make your vacation or honeymoon to Hawaii one that you will remember for a very long time. Let us help you get the most out of your vacation or Hawaiian honeymoon with lots of cost saving tips.